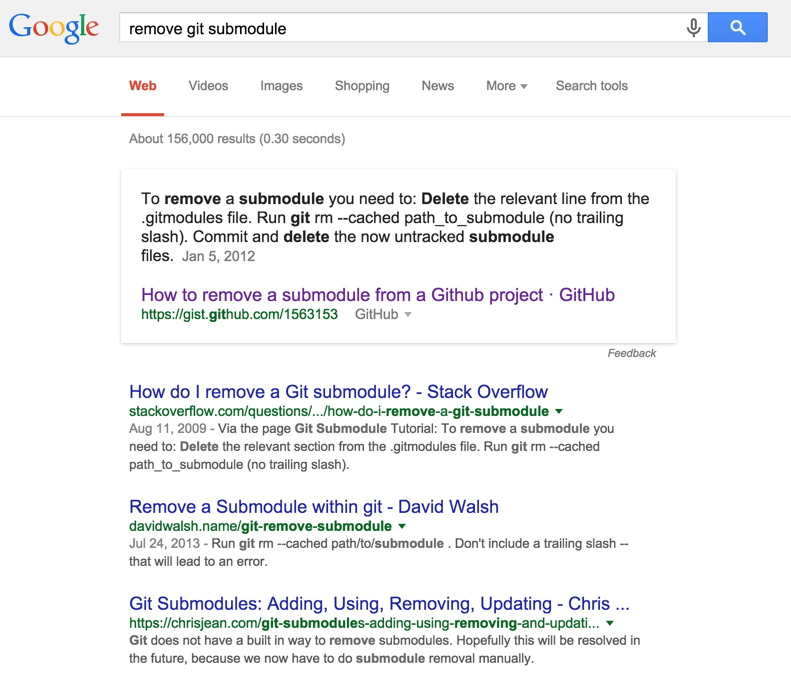 git config --remove-section submodule. "Complete submodule name"
I also had to remove .git/modules/<submodule name> directory in order to be completely rid of the submodule. Otherwise I kept on getting the error A git directory for '<submodule name>' is found locally with remote(s) when trying to re-add the submodule with same name but from different forked repository. Congratulations. Your gist made it to the top of Google's search results. Thanks! This was really handy. Small correction: “Delete the relevant lines from the .gitmodules file.” (multiple lines, even for one submodule). Delete the relevant lines from the .gitmodules file. Delete the now untracked submodule files. Can the gist be updated? Still can't believe this isn't superseded by a simple git feature. Thanks a lot, I'm from google too, and I did it successfully. You don't need to manually prune the submodule from .git/config if you run git submodule deinit <path-to-submodule> first. I was using git 2.6.3. Why doesn't the git team make this simpler? I also found that I needed to delete the relevant file/folder under .git/modules/<mySubmodule>. Seemed to work for me?